Whenever a Corp card is exposed, you may gain 1credit. I was writing this review to make a point that Zamba is pretty weak. Only problem? It isn't. Zamba plus GPI Net Tap is pretty good. It's 1 credit per unrezzed ice approached during a run. Let me just remind you what bad publicity is, you know the thing corps are so scared about: 1 free credit per run only usable during a run. Zamba + GPI Net Tap is 1 credit per unrezzed ice (determined at time of approach, so ice that got rezzed this run counts). This means that as long as the corp doesn't rez a piece of ice you get extra money. Oh, and of course you're free to derez ice yourself and the next time you'll get the credit. In combination with cards like Rubicon Switch and Keros Mcintyre a derez based strategy could be pretty economical. Assuming for the moment that the corp can rerez ice the next time you approach it you pay the cost of ice with Rubicon Switch to derez and get 2 from Keros and 1 from Zamba + GPI Net Tap the next time you approach that ice. On ice that costs 3you break even, only spending 1 click to derez the ice and the corp loses 3 to rerez. More than that and you lose Rez cost - 3, less than that and you gain credits (though the corp loses very little credits in the process). Of course what's most fun is to derez a really expensive piece of ice, perhaps with Emergency Shutdown and then when the corp can't rerez it fly by it and get money in the process. Infiltration - Not often played but I guess if you happen to have Zamba installed you'll be happy with your 1. Silhouette: Stealth Operative - One expose per turn given a successful HQ run. I guess Zamba is an interesting option when playing here just to get a bit of extra income. Drive By - Realistically Zamba simply reduces the price of this one a bit. It's an interesting card if there's a lot of Jinteki in your meta, but I doubt you'd want to include Zamba just for this. Spot the Prey - Zamba makes this 1 cheaper. Woohoo. Deuces Wild - In case you have nothing better to choose than the fourth option. 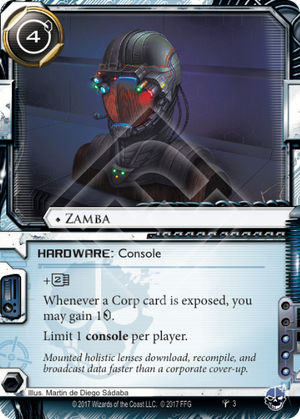 It looks like the Kitara cycle is going to have more criminal cards that expose corp cards so Zamba may in a few months not just be good with GPI Net Tap.